​Ancient Greece had a polytheistic religion in which they practiced every day, praying to multiple gods and burning offerings outside religious structures. 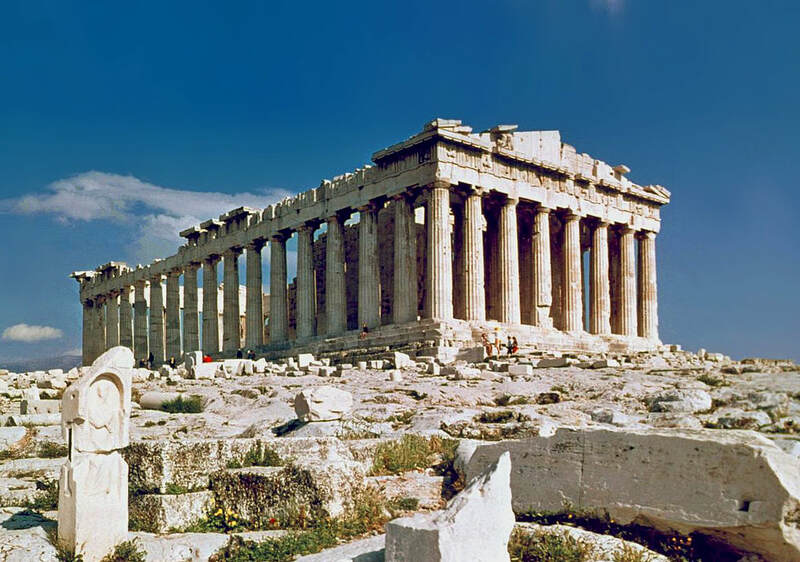 Most of the buildings created in Greece were temples to the Gods they believed in, such as Zeus, Hera, Athena, Hermes, Poseidon, Apollo, Artemis, Ares, and many others. The Greek’s liked open spaces in their designs so they built steps all around the temples they created. They put columns on the outskirts of the building and had four walls on the inside, sometimes with a dividing wall to make two rooms. The columns can be divided into orders. The orders are the Doric Order, Ionic Order, and Corinthian Order. They have different styles and markings to identify each. The pictures on the top of the columns are called metopes that depict humans and animals usually. See my historic timeline here. The most notable image in the picture is the Parthenon in the bottom center of the page. On top is a picture of the different column styles and an amphitheater. 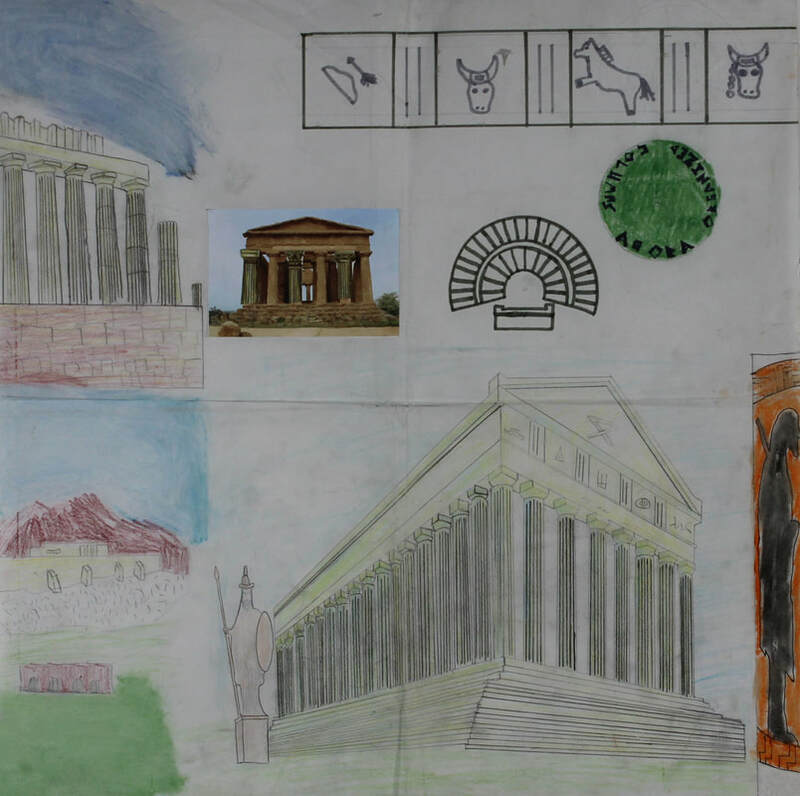 There's metopes that I created by myself to recognize some of the things I found on the Parthenon and other Greek Symbols. 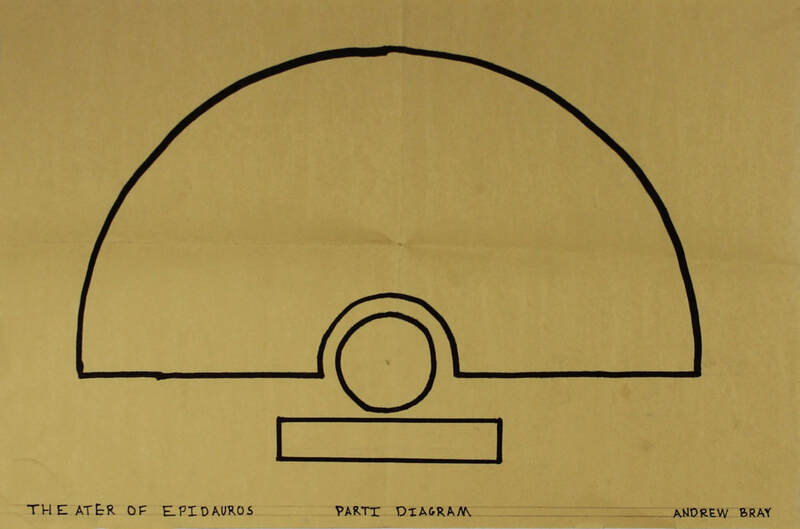 The Parti Diagram I designed was the Theater of Epidauros. 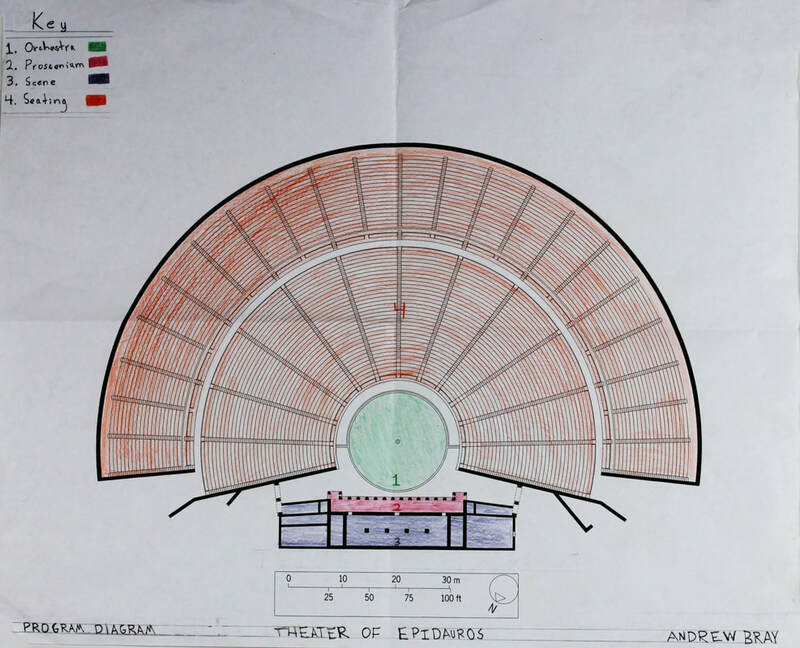 It's location is in Epidavrou Tripolis, Greece and is open seating with no roof. I designed my building to house 3 people, with 3 bedrooms and a bath room. The kitchen is the back room with a counter so they can prepare food. The center is a courtyard with a statue of Zeus and columns holding up wooden beams for decoration. There are a few windows for light during the day but few enough so the entire house won't freeze during the winter. The columns are of the Doric order because I thought it would look peaceful, just what a home should be. I started off designing my building through simple ideas. I used a rectangle to start and made some additions to make it more interesting. I added the indent at first and later put in a balcony in the very front of the house. After the designs I messed around in Google Sketchup to see what I liked and what would work for a simplistic but appealing design. This is the Google Sketchup file I created that represents my building. The orange rectangles are doors and you can see inside the house with the blue tinted windows. I started it off like my simple sketch and then as I came up with ideas in the more advanced sketches, I added in things like windows doors and ladders. After I created my final design in Google Sketchup, I switched to AutoCad and made a floor plan and elevation drawings. The bottom floor to the left and the top floor is the one on the right. The next picture with four depictions is my building from each side. There is a person for a scaling reference. This is my final model that I created off of my Google Sketchup and AutoCad files. It took time to hand carve every piece with an exacto knife and elmers glue but I pulled it off. I made the pillars for the balcony out of balsa wood. It consists of 3 bedrooms, a kitchen, a dining room, a living room, and a master bathroom.